I originally planned on posting my cinnamon rolls this week, but time got away from me. I would like to get some really nice photos of the “how to” put together on them also. I will try to get my kiddos to help me with it this weekend, so keep an eye out in the next week or two of Freezer Food Friday for that! I keep finding yummies as I sort out my new blog site. This is really tasty beef dish I first posted on April 25, 2007. I usually make 3 of this, eat one that night and put the other two in the freezer. I makes a great lettuce wrap, but is also really tasty served over rice. Head over to MJ’s for Freezer Food Friday and join in on the fun! If you have a gluten free recipe you know freezes well, leave a comment here and I will add you on for Freezer Food Friday, the Gluten Free Edition! If you would like, here is a printable recipe card for multiple batches of Orange Beef Wrap Filling for the freezer instead of using the recipe below. One for tonight and two to freeze! 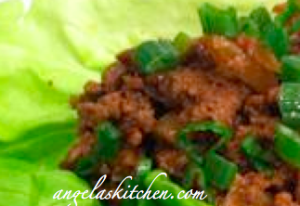 Can be used as a filling for lettuce wraps or served over rice. Cut steak into pieces 3” long and 1/8 inch thick. In bowl, combine sliced steak and cornstarch. Toss to coat and set aside. In another bowl combine sauce ingredients and set aside. Assemble bags: I set up two freezer bags with “orange beef mix,” the date, and reheating instructions written on it. You will also need a pan to warm tonight’s dinner. I divide the cooled carrots mix, cooked beef, green onions, and sauce by three, one part in each bag and one part in the pan. Squeeze out all the air from the bags, flatten and freeze.